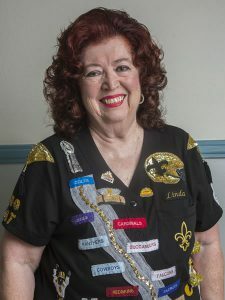 On August 28, 2015, at age 73, Linda Prattini celebrated the debut of her handmade bowling costume at The Presbytère museum on Jackson Square in New Orleans. Displayed on the eve of the 10th anniversary of Hurricane Katrina, the costume depicts broken levees and the flooded and devastated city of New Orleans. Linda designed her first bowling costume in 1969 as a protest against the rigid dress codes for women at her league’s national championship. Within two years, the league relaxed the code and allowed women to wear pants. Some artists speak with oils and canvas. Linda tells stories through fabric, sequins and stones. Her costumes are her voice, and many of those costumes continue to speak to people from their display cases at the Bowling Hall of Fame. When she designed the Katrina costume for the 2006 championship in Reno, Nevada, she was telling the story of her hometown to people from around the country and around the world. Now, on display at The Presbytère, her costume tells that story to a much larger audience, well beyond the world of bowling. Linda dreamed of being a fashion designer since she was a child playing with paper dolls, but by the time she reached her 20s and created an elaborate vampire outfit for Halloween, she realized costume design was in her blood. It came naturally to her. And she has only gotten better with age. Her 2010 costume commemorating the New Orleans Saints’ climb to world champion status is historically accurate all the way down to the players’ gloves and the colors of the opposing teams. In this 50th year of the Saints, Linda is celebrating her 50th year bowling with the US Bowling Congress. As Linda’s team is the only one with a costuming tradition, other bowlers look forward to Linda’s newest designs. She refuses to reveal her 2017 concept, but knowing Linda, it’ll tell a compelling story. Linda Prattini … Peoples Health Champion.